How tolerant is “secular Israel” of intermarriage? Secular Israel, not quite as tolerant as it’s commentators pretend? For years secular Jewish Israelis on the left have painted themselves as models of tolerance, a “little Europe” in the Middle East, what Ehud Barack called “the village in the jungle”; or Dudu Topaz called “the beautiful Israel”…and articles by their representatives in media have accused, as Amos Elon others did, “Russians, Mizrahim and Haredim” of bringing intolerance into Israel (‘bringing in’, because their narrative tends to see these groups as “foreign” and secular Israel as “native sabras”, despite the obvious illogic). Just last month a professor at IDC proudly said “huge majority of Ashkenazi protesters for peace in Tel Aviv”, indicting that “our people” support peace. 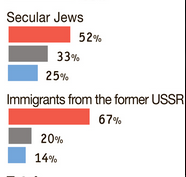 Turns out secular Israel is less accepting than immigrants from the FSU when it comes to marrying Europeans and those who are not fully Jewish…and more tolerant, but not that much, when it comes to Arabs.